I’m not sure what I Luv most about this recipe…the fact that it comes together so easily and can be made ahead of time or that it tastes soooo delicious!!! This would make a great side dish for Easter dinner, pairing nicely with a Leg of Lamb or Easter Ham. I’m not sure what I Love most about this recipe…the fact that it comes together so easily and can be made ahead of time or that it tastes soooo delicious!!! 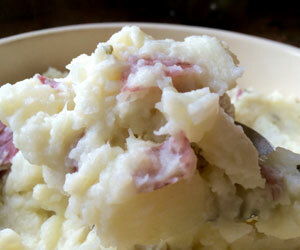 This would make a great side dish for dinner, pairing nicely with a Leg of Lamb or Ham. Note: Freeze the broth from your cooked cauliflower and potatoes; you will be able to use it in next month’s recipe. Break down cauliflower into large florets and quarter potatoes (leaving skin on); place into a 3 quart pot with onion and cover with chicken broth. Bring to a boil. Cover and simmer for 20 minutes or until tender. Drain liquid from pot, reserving for another use (recipe coming next month). Remove onion. Add butter and cream cheese to pot with vegetables and cover with lid until butter has melted. Uncover and smash vegetables with a potato masher (I like mine more on the chunky side). Stir only until butter and cream cheese are mixed in; any longer and you will lose some of your texture. Serve it hot from the pot or spoon into a greased casserole dish to serve immediately. You may refrigerate the casserole overnight and reheat in a 350’ oven for approximately 40 minutes or until heated through.